Potholing (also referred to as “daylighting”) is the process of digging a test hole to expose underground utilities, pipes, etc. to determine their positions and horizontal and vertical orientations, and to check for any damage such as punctures and cracks. This is an important maintenance process for pipes and utilities that needs to be done from time to time. Traditionally, this was done with a backhoe, which is a cumbersome and high-risk practice, or via hand digging, which is labor-intensive, time-consuming, and not the least bit efficient. Hydro excavation is now the preferred method for potholing or daylighting. Hydro excavation enables the exposure of underground utilities without the inherent risks of utility or equipment damage present in traditional manual or mechanical excavation methods, because hydro excavation is a non-mechanical, non-destructive process. 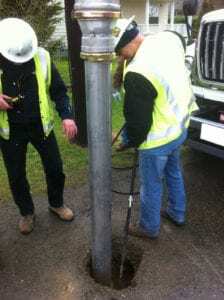 Potholing is also a time and cost-effective digging method for the installation of signs, telephone and utility poles, fences, and any application requiring a post being set in the ground. For potholing or daylighting, Super Products’ Mud Dog® Hydro Excavators use a unique combination of pressurized water and an industrial-strength vacuum, all combined in one self-contained, mobile unit. Water is pressurized and injected into the ground through a handheld wand (much like a conventional pressure washer) to safely break up soil from the underground area. The resulting slurry of displaced soil and water is then immediately vacuumed from the excavation site through a large debris hose connected to a debris tank housed in the self-contained, mobile unit. Since hydro excavation is a non-mechanical, non-destructive process, the risk of damage to buried cables and pipes is virtually eliminated. Unlike traditional manual or mechanical digging, hydro excavation is a very precise digging method and enables the location, type, and depth of the utility to be accurately established, significantly reducing the risk for project delays, utility or equipment damage, or service interruptions due to inaccurate digging.